She finally mastered this pose on roller skates. Super-Maggie has a new word that she loves to say. "Woah." It started when she was racing back and forth through the living room on roller skates. I could watch her skate all day long. Her skates have back breaks and she's mastered skating in them. She skates fast and stops suddenly. She uses the back break to make sharp turns and to even twirl. And she hardly ever falls. Yesterday she was skating and fell and I said "Woah!" and before I could even ask if she was okay she was laughing hysterically and repeated the word back to me. Then she jumped up and skated across the room fast, looked at me and smiled and then very intentionally (and carefully) fell and looked over at me and waited until I said "woah!" again and laughed and laughed and laughed. After repeating this several times she changed into her mermaid tail, and then another mermaid tail and then back into her Elsa dress (which is her favorite outfit to roller skate in). Later in the day she did something and I said "woah!" and she laughed again and ran and put on her roller skates. Then she skated into the living room and I watched as she leaned forward, lifting her left leg up behind her until it was straight out at waist level, with her arms held out to the side. 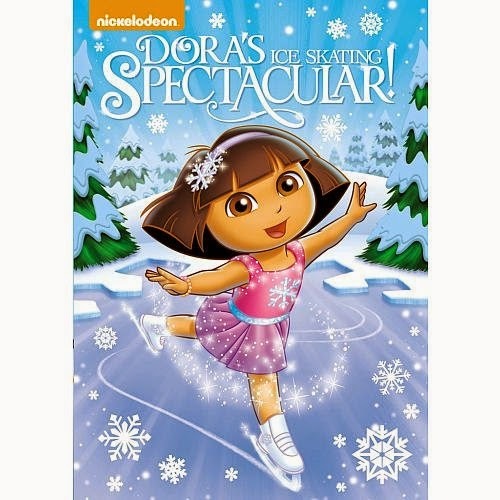 It was obvious from her face that she expected to fall, but instead she floated across the room on her skates and then looked surprised that she'd actually successfully done that particular skating move (she has a Dora DVD cover that she's carried around for ages, and that is exactly what Dora is doing on the cover). Then she fell, on purpose, and laughed and laughed and laughed. We've got to get this kid on ice skates. I have a feeling that she would love them. My older girl didn't do well in lessons as a young child in a group setting but later on (age 11) I enrolled her in one group session and she just became a whiz on skates) But Maggie already sounds like she'll be naturally awesome! Sadie used to do lessons before the rec district canceled them. I wish they still had lessons through the city here because it was such a great program and I think we would have put Maggie in them last year (or at least taken her along skating while Sadie was in lessons). I was thinking through the post that she'd be amazing on ice. I can hardly wait to see how she takes to it! Part of me is a little nervous that she'll just take off across the ice! I kept smiling all last night every time I thought of it!